The Astros made it clear from the beginning of free agency that left-handed-hitting outfielder Josh Reddick was a high-priority signing for the club in strengthening its lineup. "He's a perfect fit for our team," Astros general manager Jeff Luhnow said. "A Gold Glove-caliber outfielder with a terrific arm. We're going to have a formidable outfield." Reddick, who agreed to terms on a four-year, $52 million contract, was introduced on Wednesday wearing jersey No. 22 at a news conference at Minute Maid Park, a venue that he is familiar with. Reddick, a first-time free agent, played in the American League West for the A's from 2012-16, capturing a Gold Glove for his play in right field in '12. "It's great to be at a ballpark that's hitter-friendly," said the 29-year-old Reddick, whose power numbers diminished last season because of injury. But he set career highs in batting average (.281) and on-base percentage (.345) over 115 games with Oakland (68 games) and the Dodgers (47 games). With the Astros targeting him, Reddick said the decision process to choose a team with a young nucleus that includes second baseman Jose Altuve, shortstop Carlos Correa and right fielder George Springer was easy to make. "It wasn't that tough. These guys came aggressive and made it known early that they wanted me," Reddick said. "They made the decision pretty easy. I get to stay in the same division. I feel very comfortable being in this division. I know how things work. I know the pitching staffs, I know the hitters. This will make it an easy transition for me." Last week, the Astros traded for catcher Brian McCann, another left-handed bat to offset the number of right-handed hitters in Houston's lineup under manager A.J. Hinch. Reddick hit .322 against right-handed pitching last season. He also posted a .386 on-base percentage, .485 slugging percentage and .871 OPS. "This lengthens our lineup out quite a bit," Luhnow said. "That was a goal in the offseason. Pitchers are not going to have too many soft spots in our lineup, day in and day out. We've seen him in the division a bit in the past few years. We've seen him burn us with his arm and with his bat, so it's great to have him on our side." Added Reddick: "This is a very dangerous lineup. These guys are something special. I'm excited to be here. It's a young team. These guys were always a pain in my side." 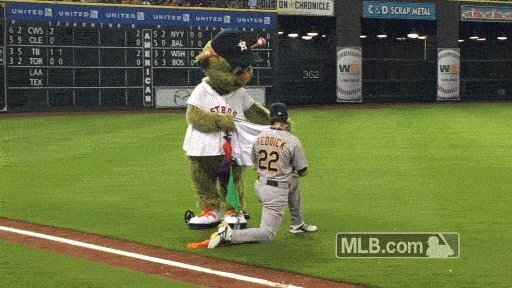 Reddick most likely will remain in right field for the Astros. Springer has been a fixture in right field since being called up by the Astros in 2014, but he excelled in center field in the Minors and will likely move there in '17. But that's Hinch's decision. Springer was one of three finalists this season for the AL Gold Glove Award for right fielders. "We're all open to whatever configuration makes sense to the team," Luhnow said. "George is willing to do whatever he needs to do to help our team, and Josh has the same attitude. When you got outfielders who are as talented as these guys are and are willing to play wherever you want to put them … A.J. is going to have to make that determination. "We still might make a move or two this offseason that can impact our outfield mix. At this point, we're happy with what we have. We know Josh is capable of playing a Gold Glove-caliber outfield as is George. We're happy to have them both out there." The Astros also have matchup flexibility with speedy Jake Marisnick, an exceptional defender, as a center-field option. The signing of Reddick gives the Astros 38 players on their 40-man roster. Welcome to the Astros @RealJoshReddick! 2 Things: (1)I'm assembling our bunk beds next week (2)Please remember to bring your own underwear. Reddick said he likes the way the Astros play and thought the AL MVP Award should have gone to Altuve, who finished third behind winner Mike Trout of the Angels and Mookie Bettsof the Red Sox. "I was watching this MVP race and I have no idea how Jose didn't win it," Reddick said. "I'm not saying it because I have the uniform on right now. I was actually pulling for him because he's such a great guy and he plays the game the right way." Reddick is also a fan of Hinch and how he relates to the players. "From talking to him on the phone, he seems to be a guy that I can appreciate," Reddick said. "He's a talkative manager to his players, very personal. That's something I like."